An unsanctioned rally organized by Armenia's political opposition resulted in violence between police and demonstrators early Tuesday morning (April 13). The clash between police and protestors was more violent than any incident during last year's heated presidential elections. Outside the office of People's Party of Armenia. Dozens of protestors were injured; several, including journalists, required treatment in hospital. Using water canons, percussion grenades and nightsticks, police charged crowds on Bagramian Avenue outside Parliament and the Presidential Residence. Eyewitnesses say the crowd was attacked shortly after midnight as it approached, but did not attempt to break, a police cordon. State Police Department spokesman Sayat Shirinyan told journalists Tuesday that police were provoked when demonstrators started throwing bottles and stones and shouting insults and claiming to be armed. 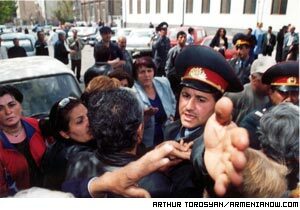 Shavarsh Kocharyan, he came to a 'peaceful demonstration' carrying a gun." Wielding nightsticks, police chased and beat hundreds who tried to flee onto interior streets off the main avenue. Observers say police -- believed to be a special riot unit -- continued to pursue and beat demonstrators even after they had fled the scene of the protest. Inside the office of People's Party of Armenia. Before violence erupted, the protestors -- a smaller crowd than had initially been on hand, estimated at about 10,000 when the rally started -- had been dancing to the music of zurna and duduk, after a seven-hour demonstration in which they chanted "Kocharyan, leave". "illegitimate" by the opposition. The recent actions follow a boycott of Parliament members of the Justice Bloc, representing the opposition. Among the injured was ORT Russian television cameraman Levon Grigoryan, who is said to be in serious condition. Two staff of the radically oppositional newspaper "Haykakan Zhamanak" were also injured and reported that they witnessed oppositional leader and MP Shavarsh Kocharyan being beaten by police. The number of injuries is unknown, but Armenian Democratic Union party leader Vazgen Manukyan said at an oppositional press conference Tuesday: "Several hundred people were injured, however they do not apply to hospital, for fear of being detained." presidential candidate Artashes Geghamyan told ArmeniaNow that his house had been searched and that he had been beaten. 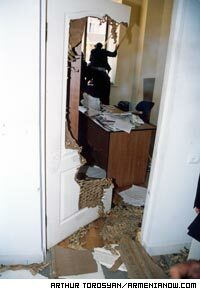 Around the time that the demonstration was dispersed, attacks by unknown assailants took place on the headquarters of major oppositional parties, including that of the PPA, home base of former oppositional presidential candidate Stepan Demirchyan. 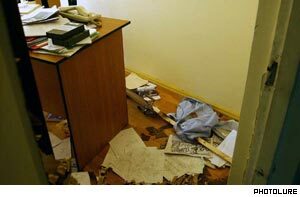 Headquarters were ransacked and property destroyed. Late Tuesday the office of the President released a statement saying that efforts will be made to stop “political extremism”. Wednesday (April 7) was "Day of Mothers and Beauty" in Armenia. At Zvartnots International Airport, staff greeted girls and women with flowers -- one small step for womenkind, one giant leap for civility in civil aviation.